Aargau (help·info); rarely anglicized Argovia; see also other names) is one of the more northerly cantons of Switzerland. It is situated by the lower course of the Aare, which is why the canton is called Aar-gau (meaning Aare province). It is one of the most densely populated regions of Switzerland. The area of Aargau and the surrounding areas were controlled by the Helvetians, a member of the Celts, as far back as 200 BC, eventually being occupied by the Romans and then by the 6th century, the Franks. The Romans built a major settlement called Vindonissa, near the present location of Brugg. In early medieval times, the Aargau was a disputed border region between the duchies of Alamannia and Burgundy. A line of the von Wetterau (Conradines) intermittently held the countship of Aargau from 750 until about 1030, when they lost it (having in the meantime taken the name von Tegerfelden). From the extinction in 1254 of the Hohenstaufen dynasty until 1415, the area was ruled by the Habsburgs,[nb 1] and many castles from that time still stand (examples include Habsburg, Lenzburg, Tegerfelden, Bobikon, Stin and Wildegg). The Habsburgs founded a number of monasteries (with some structures enduring, e.g., in Wettingen and Muri), the closing of which by the government in 1841 was a contributing factor to the outbreak of the Swiss civil war – the "Sonderbund War" – in 1847. Switzerland in 1416, showing the part of the Aargau under Bernese control, the county of Baden and the Freie Ämter. When Frederick IV of Habsburg sided with Antipope John XXIII at the Council of Constance, Emperor Sigismund placed him under the Imperial ban. [nb 2] In July 1414, the Pope visited Bern and received assurances from them, that they would move against the Habsburgs. A few months later the Swiss Confederation denounced the Treaty of 1412. Shortly thereafter in 1415, Bern and the rest of the Swiss Confederation used the ban as a pretext to invade the Aargau. The Confederation was able to quickly conquer the towns of Aarau, Lenzburg, Brugg and Zofingen along with most of the Habsburg castles. Bern kept the southwest portion (Zofingen, Aarburg, Aarau, Lenzburg, and Brugg), northward to the confluence of the Aare and Reuss. The important city of Baden was taken by a united Swiss army and governed by all 8 members of the Confederation. Some districts, named the Freie Ämter (free bailiwicks) – Mellingen, Muri, Villmergen, and Bremgarten, with the countship of Baden – were governed as "subject lands" by all or some of the Confederates. Shortly after the conquest of the Aargau by the Swiss, Frederick humbled himself to the Pope. The Pope reconciled with him and ordered all of the taken lands to be returned. The Swiss refused and years later after no serious attempts at re-acquisition, the Duke officially relinquished rights to the Swiss. Bern's portion of the Aargau came to be known as the Unteraargau, though can also be called the Berner or Bernese Aargau. In 1514 Bern expanded north into the Jura and so came into possession of several strategically important mountain passes into the Austrian Fricktal. This land was added to the Unteraargau and was directly ruled from Bern. It was divided into seven rural bailiwicks and four administrative cities, Aarau, Zofingen, Lenzburg and Brugg. While the Habsburgs were driven out, many of their minor nobles were allowed to keep their lands and offices, though over time they lost power to the Bernese government. The bailiwick administration was based on a very small staff of officials, mostly made up of Bernese citizens, but with a few locals. When Bern converted during the Protestant Reformation in 1528, the Unteraargau also converted. At the beginning of the 16th century a number of anabaptists migrated into the upper Wynen and Rueder valleys from Zurich. Despite pressure from the Bernese authorities in the 16th and 17th centuries anabaptism never entirely disappeared from the Unteraargau. Bern used the Aargau bailiwicks mostly as a source of grain for the rest of the city-state. The administrative cities remained economically only of regional importance. However, in the 17th and 18th centuries Bern encouraged industrial development in Unteraargau and by the late 18th century it was the most industrialized region in the city-state. The high industrialization led to high population growth in the 18tf century, for example between 1764–98, the population grew by 35%, far more than in other parts of the canton. In 1870 the proportion of farmers in Aarau, Lenzburg, Kulm, and Zofingen districts was 34–40%, while in the other districts it was 46–57%. The rest of the Freie Ämter were collectively administered as subject territories by the rest of the Confederation. Muri Amt was assigned to Zurich, Lucerne, Schwyz, Unterwalden, Zug and Glarus, while the Ämter of Meienberg, Richensee and Villmergen were first given to Lucerne alone. The final boundary was set in 1425 by an arbitration tribunal and Lucerne had to give the three Ämter to be collectively ruled. The four Ämter were then consolidated under a single Confederation bailiff into what was known in the 15th century as the Waggental Bailiwick (German: Vogtei im Waggental). In the 16th century, it came to be known as the Vogtei der Freien Ämter. While the Freien Ämter often had independent lower courts, they were forced to accept the Confederation's sovereignty. Finally, in 1532, the canton of Uri became part of the collective administration of the Freien Ämter. At the time of Reformation, the majority of the Ämter converted to the new faith. In 1529, a wave of iconoclasm swept through the area and wiped away much of the old religion. After the defeat of Zurich in the second Battle of Kappel in 1531, the victorious five Catholic cantons marched their troops into the Freie Ämter and reconverted them to Catholicism. In the First War of Villmergen, in 1656, and the Toggenburg War (or Second War of Villmergen), in 1712, the Freie Ämter became the staging ground for the warring Reformed and Catholic armies. While the peace after the 1656 war did not change the status quo, the fourth Peace of Aarau in 1712 brought about a reorganization of power relations. The victory gave Zurich the opportunity to force the Catholic cantons out of the government in the county of Baden and the adjacent area of the Freie Ämter. The Freie Ämter were then divided in two by a line drawn from the gallows in Fahrwangen to the Oberlunkhofen church steeple. The northern part, the so-called Unteren Freie Ämter (lower Freie Ämter), which included the districts of Boswil (in part) and Hermetschwil and the Niederamt, were ruled by Zurich, Bern and Glarus. The southern part, the Oberen Freie Ämter (upper Freie Ämter), were ruled by the previous seven cantons but Bern was added to make an eighth. During the Helvetic Republic (1798–1803), the county of Baden, the Freie Ämter and the area known as the Kelleramt were combined into the Canton of Baden. The County of Baden was a shared condominium of the entire Old Swiss Confederacy. After the Confederacy conquest in 1415, they retained much of the Habsburg legal structure, which caused a number of problems. The local nobility had the right to hold the low court in only about one fifth of the territory. There were over 30 different nobles who had the right to hold courts scattered around the surrounding lands. All these overlapping jurisdictions caused numerous conflicts, but gradually the Confederation was able to acquire these rights in the County. The cities of Baden, Bremgarten and Mellingen became the administrative centers and held the high courts. Together with the courts, the three administrative centers had considerable local autonomy, but were ruled by a governor who was appointed by the Acht Orte every two years. After the Protestant victory at the Second Battle of Villmergen, the administration of the County changed slightly. Instead of the Acht Orte appointing a bailiff together, Zurich and Bern each appointed the governor for 7 out of 16 years while Glarus appointed him for the remaining 2 years. The chaotic legal structure and fragmented land ownership combined with a tradition of dividing the land among all the heirs in an inheritance prevented any large scale reforms. The governor tried in the 18th century to reform and standardize laws and ownership across the County, but with limited success. With an ever changing administration, the County lacked a coherent long-term economic policy or support for reforms. By the end of the 18th century there were no factories or mills and only a few small cottage industries along the border with Zurich. Road construction first became a priority after 1750, when Zurich and Bern began appointing a governor for seven years. During the Protestant Reformation, some of the municipalities converted to the new faith. However, starting in 1531, some of the old parishes were converted back to the old faith. The governors were appointed from both Catholic and Protestant cantons and since they changed every two years, neither faith gained a majority in the County. The County was the only federal condominium in the 17th century where Jews were tolerated. In 1774, they were restricted to just two towns, Endingen and Lengnau. While the rural upper class tried several times to finally expel the Jews, the financial interests of the authorities prevented this. The Jews were directly subordinate to the governor starting in 1696 when they were forced to buy a protecting and shielding letter every 16 years from the governor. After the French invasion, on 19 March 1798, the governments of Zurich and Bern agreed to the creation of the short lived Canton of Baden in the Helvetic Republic. With the Act of Mediation in 1803, the Canton of Baden was dissolved. Portions of the lands of the former County of Baden now became the District of Baden in the newly created Canton of Aargau. After World War II, this formerly agrarian region saw striking growth and became the district with the largest and densest population in the Canton (110,000 in 1990, 715 persons per km2). The contemporary canton of Aargau was formed in 1803, a canton of the Swiss Confederation as a result of the Act of Mediation. It was a combination of three short-lived cantons of the Helvetic Republic: Aargau (1798—1803), Baden (1798—1803) and Fricktal (1802—1803). Its creation is therefore rooted in the Napoleonic era. In the year 2003, the canton of Aargau celebrated its 200th anniversary. French forces occupied the Aargau from 10 March to 18 April 1798; thereafter the Bernese portion became the canton of Aargau and the remainder formed the canton of Baden. Aborted plans to merge the two halves came in 1801 and 1802, and they were eventually united under the name Aargau, which was then admitted as a full member of the reconstituted Confederation following the Act of Mediation. Some parts of the canton of Baden at this point were transferred to other cantons: the Amt of Hitzkirch to Lucerne, whilst Hüttikon, Oetwil an der Limmat, Dietikon and Schlieren went to Zürich. In return, Lucerne's Amt of Merenschwand was transferred to Aargau (district of Muri). The Fricktal, ceded in 1802 by Austria via Napoleonic France to the Helvetic Republic, was briefly a separate canton of the Helvetic Republic (the canton of Fricktal) under a Statthalter ('Lieutenant'), but on 19 March 1803 (following the Act of Mediation) was incorporated into the canton of Aargau. The former cantons of Baden and Fricktal can still be identified with the contemporary districts – the canton of Baden is covered by the districts of Zurzach, Baden, Bremgarten, and Muri (albeit with the gains and losses of 1803 detailed above); the canton of Fricktal by the districts of Rheinfelden and Laufenburg (except for Hottwil which was transferred to that district in 2010). In the 17th century, Jews were banished from Switzerland. However, a few families were permitted to live in two villages, Endingen and Lengnau, in Aargau which became the Jewish ghetto in Switzerland. During this period, Jews and Christians were not allowed to live under the same roof, neither were Jews allowed to own land or houses. They were taxed at a much higher rate than others and, in 1712, the Lengnau community was "pillaged." In 1760, they were further restricted regarding marriages and multiplying. This remained the case until the 19th century. In 1799, all special tolls were abolished, and, in 1802, the poll tax was removed. On 5 May 1809, they were declared citizens and given broad rights regarding trade and farming. They were still restricted to Endingen and Lengnau until 7 May 1846, when their right to move and reside freely within the canton of Aargau was granted. On 24 September 1856, the Swiss Federal Council granted them full political rights within Aargau, as well as broad business rights; however the majority Christian population did not abide by these new liberal laws fully. The time of 1860 saw the canton government voting to grant suffrage in all local rights and to give their communities autonomy. Before the law was enacted, it was repealed due to vocal opposition lead by the Ultramonte Party. Finally, the federal authorities in July 1863, granted all Jews full rights of citizens. However, they did not receive all of the rights in Endingen and Lengn until a resolution of the Grand Council, on 15 May 1877, granted citizens' rights to the members of the Jewish communities of those places, giving them charters under the names of New Endingen and New Lengnau. The Swiss Jewish Kulturverein was instrumental in this fight from its founding in 1862 until it was dissolved 20 years later. During this period of diminished rights, they were not even allowed to bury their dead in Swiss soil and had to bury their dead on an island called Judenäule (Jews' Isle) on the Rhine near Waldshut. The capital of the canton is Aarau, which is located on its western border, on the Aare. The canton borders Germany to the north, the Rhine forming the border. To the west lie the Swiss cantons of Basel-Landschaft, Solothurn and Bern; the canton of Lucerne lies south, and Zürich and Zug to the east. Its total area is 1,404 square kilometers (542 sq mi). It contains both large rivers, the Aare and the Reuss. The canton of Aargau is one of the least mountainous Swiss cantons, forming part of a great table-land, to the north of the Alps and the east of the Jura, above which rise low hills. The surface of the country is beautifully diversified, undulating tracts and well-wooded hills alternating with fertile valleys watered mainly by the Aare and its tributaries. The valleys alternate with pleasant hills, most of which are full of woods. Slightly over one-third of the canton is wooded (518 square kilometers (200 sq mi)), while nearly half is used from farming (635.7 square kilometers (245.4 sq mi)). 33.5 square kilometers (12.9 sq mi) or about 2.4% of the canton is considered unproductive, mostly lakes (notably Lake Hallwil) and streams. With a population density of 450/km2 (1,200/sq mi), the canton has a relatively high amount of land used for human development, with 216.7 square kilometers (83.7 sq mi) or about 15% of the canton developed for housing or transportation. It contains the famous hot sulphur springs of Baden and Schinznach-Bad, while at Rheinfelden there are very extensive saline springs. Just below Brugg the Reuss and the Limmat join the Aar, while around Brugg are the ruined castle of Habsburg, the old convent of Königsfelden (with fine painted medieval glass) and the remains of the Roman settlement of Vindonissa (Windisch). Fahr Abbey forms a small exclave of the canton, otherwise surrounded by the canton of Zürich, and since 2008 is part of the Aargau municipality of Würenlos. The most recent change in district boundaries occurred in 2010 when Hottwil transferred from Brugg to Laufenburg, following its merger with other municipalities, all of which were in Laufenburg. There are (as of 2014) 213 municipalities in the canton of Aargau. As with most Swiss cantons there has been a trend since the early 2000s for municipalities to merge, though mergers in Aargau have so far been less radical than in other cantons. The blazon of the coat of arms is Per pale, dexter: sable, a fess wavy argent, charged with two cotises wavy azure; sinister: sky blue, three mullets of five argent. The flag and arms of Aargau date to 1803 and are an original design by Samuel Ringier-Seelmatter; the current official design, specifying the stars as five-pointed, dates to 1930. Aargau has a population (as of December 2012) of 627,893. As of 2010, 21.5% of the population are resident foreign nationals. Over the last 10 years (2000–2010) the population has changed at a rate of 11%. Migration accounted for 8.7%, while births and deaths accounted for 2.8%. Most of the population (as of 2000) speaks German (477,093 or 87.1%) as their first language, Italian is the second most common (17,847 or 3.3%) and Serbo-Croatian is the third (10,645 or 1.9%). There are 4,151 people who speak French and 618 people who speak Romansh. Of the population in the canton, 146,421 or about 26.7% were born in Aargau and lived there in 2000. There were 140,768 or 25.7% who were born in the same canton, while 136,865 or 25.0% were born somewhere else in Switzerland, and 107,396 or 19.6% were born outside of Switzerland. As of 2000, children and teenagers (0–19 years old) make up 24.3% of the population, while adults (20–64 years old) make up 62.3% and seniors (over 64 years old) make up 13.4%. As of 2000, there were 227,656 people who were single and never married in the canton. There were 264,939 married individuals, 27,603 widows or widowers and 27,295 individuals who are divorced. As of 2000, there were 224,128 private households in the canton, and an average of 2.4 persons per household. There were 69,062 households that consist of only one person and 16,254 households with five or more people. As of 2009, the construction rate of new housing units was 6.5 new units per 1000 residents. The vacancy rate for the canton, in 2010, was 1.54%. The majority of the population is centered on one of three areas: the Aare Valley, the side branches of the Aare Valley, or along the Rhine. In the 2011 federal election, the most popular party was the SVP which received 34.7% of the vote. The next three most popular parties were the SP/PS (18.0%), the FDP (11.5%) and the CVP (10.6%). The SVP received about the same percentage of the vote as they did in the 2007 Federal election (36.2% in 2007 vs 34.7% in 2011). The SPS retained about the same popularity (17.9% in 2007), the FDP retained about the same popularity (13.6% in 2007) and the CVP retained about the same popularity (13.5% in 2007). 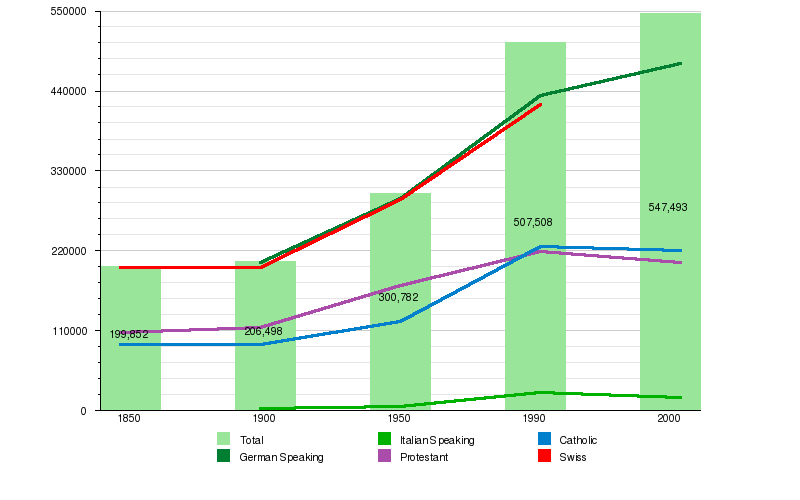 From the 2000 census, 219,800 or 40.1% were Roman Catholic, while 189,606 or 34.6% belonged to the Swiss Reformed Church. Of the rest of the population, there were 11,523 members of an Orthodox church (or about 2.10% of the population), there were 3,418 individuals (or about 0.62% of the population) who belonged to the Christian Catholic Church, and there were 29,580 individuals (or about 5.40% of the population) who belonged to another Christian church. There were 342 individuals (or about 0.06% of the population) who were Jewish, and 30,072 (or about 5.49% of the population) who were Islamic. There were 1,463 individuals who were Buddhist, 2,089 individuals who were Hindu and 495 individuals who belonged to another church. 57,573 (or about 10.52% of the population) belonged to no church, are agnostic or atheist, and 15,875 individuals (or about 2.90% of the population) did not answer the question. In Aargau about 212,069 or (38.7%) of the population have completed non-mandatory upper secondary education, and 70,896 or (12.9%) have completed additional higher education (either university or a Fachhochschule). Of the 70,896 who completed tertiary schooling, 63.6% were Swiss men, 20.9% were Swiss women, 10.4% were non-Swiss men and 5.2% were non-Swiss women. As of 2010, Aargau had an unemployment rate of 3.6%. As of 2008, there were 11,436 people employed in the primary economic sector and about 3,927 businesses involved in this sector. 95,844 people were employed in the secondary sector and there were 6,055 businesses in this sector. 177,782 people were employed in the tertiary sector, with 21,530 businesses in this sector. In 2008 the total number of full-time equivalent jobs was 238,225. The number of jobs in the primary sector was 7,167, of which 6,731 were in agriculture, 418 were in forestry or lumber production and 18 were in fishing or fisheries. The number of jobs in the secondary sector was 90,274 of which 64,089 or (71.0%) were in manufacturing, 366 or (0.4%) were in mining and 21,705 (24.0%) were in construction. The number of jobs in the tertiary sector was 140,784. In the tertiary sector; 38,793 or 27.6% were in the sale or repair of motor vehicles, 13,624 or 9.7% were in the movement and storage of goods, 8,150 or 5.8% were in a hotel or restaurant, 5,164 or 3.7% were in the information industry, 5,946 or 4.2% were the insurance or financial industry, 14,831 or 10.5% were technical professionals or scientists, 10,951 or 7.8% were in education and 21,952 or 15.6% were in health care. Of the working population, 19.5% used public transportation to get to work, and 55.3% used a private car. Public transportation – bus and train – is provided by Busbetrieb Aarau AG. The farmland of the canton of Aargau is some of the most fertile in Switzerland. Dairy farming, cereal and fruit farming are among the canton's main economic activities. The canton is also industrially developed, particularly in the fields of electrical engineering, precision instruments, iron, steel, cement and textiles. Three of Switzerland's five nuclear power plants are in the canton of Aargau (Beznau I + II and Leibstadt). Additionally, the many rivers supply enough water for numerous hydroelectric power plants throughout the canton. The canton of Aargau is often called "the energy canton". A significant number of people commute into the financial center of the city of Zürich, which is just across the cantonal border. As such the per capita cantonal income (in 2005) is 49,209 CHF. Tourism is significant, particularly for the hot springs at Baden and Schinznach-Bad, the ancient castles, the landscape, and the many old museums in the canton. Hillwalking is another tourist attraction but is of only limited significance. ^ The Habsburgs were probably from the canton of Aargau originally. ^ The Imperial Ban outlawed all possessions of that person or family, in this case th Habsburgs. Thereafter, the Habsburg lands were open to the taking. Bridgwater, W.; Aldrich, Beatrice, eds (1968). "Aargau". The Columbia-Viking Desk Encyclopedia (3rd ed.). New York, NY: Columbia University Press. ISBN 978-0670230709. Cohen, Saul B., ed (1998). "Aargau". The Columbia Gazetteer of the World. New York, NY: Columbia University Press. ISBN 0-231-11040-5. Farbkarte, S. (2002). Neuenschwander, Eva Meret; Schneider, Jürg. eds (in German). Schweiz mit Liechtenstein [Switzerland with Liechtenstein]. Bielefeld, Germany: Reise Know-how Verlag. ISBN 3-8317-1064-3. Federal Department of Statistics (2013). "Nationalratswahlen 2007: Stärke der Parteien nach Kanton [Election 2007: strength of the parties to Canton]" (Excel). http://www.bfs.admin.ch/bfs/portal/de/index/themen/17/02/blank/data/04/03.Document.110671.xls. Retrieved 19 November 2013. Federal Department of Statistics (2013a). "STAT-TAB: Die interaktive Statistikdatenbank: Datenwürfel für Thema 06.2 – Unternehmen [STAT-TAB: The interactive statistical database: Data cube for about 06.2 – company]". http://www.pxweb.bfs.admin.ch/Database/German_06%20-%20Industrie%20und%20Dienstleistungen/06.2%20-%20Unternehmen/06.2%20-%20Unternehmen.asp?lang=1&prod=06&secprod=2&openChild=true. Retrieved 19 November 2013. Federal Department of Statistics (2013b). "Federal Department of Statistics". http://www.bfs.admin.ch/bfs/portal/en/index/themen/04/02/05/key/pro-kopf-einkommen.html. Federal Department of Statistics (2011). "Sprachen, Religionen – Daten, Indikatoren Religionen [Languages, religions – Data, indicators religions]". http://www.bfs.admin.ch/bfs/portal/de/index/themen/01/05/blank/key/religionen.html. Retrieved 19 November 2013. Federal Department of Statistics (2011a). "Sprachen, Religionen – Daten, Indikatoren Sprachen [Languages, religions – Data, indicators languages]". http://www.bfs.admin.ch/bfs/portal/de/index/themen/01/05/blank/key/sprachen.html. Retrieved 19 November 2013. Federal Department of Statistics (2006). "Arealstatistik – Kantonsdaten nach 15 Nutzungsarten [Land Use Statistics – Canton data after 15 uses]" (Excel). http://www.bfs.admin.ch/bfs/portal/de/index/themen/02/03/blank/key/01/zustand_und_entwicklung__tabelle.html. Retrieved 15 January 2009. Federal Department of Statistics (2000). "STAT-TAB: Die interaktive Statistikdatenbank [STAT-TAB: The interactive statistical database]". http://www.pxweb.bfs.admin.ch/Database/German_40%20-%20Eidgen%C3%B6ssische%20Volksz%C3%A4hlung/40.3%20-%202000/40.3%20-%202000.asp?lang=1&prod=40&secprod=3&openChild=true. Retrieved 19 November 2013. (1932) "Die territoriale Entwicklung der schweizerischen Eidgenossenschaft 1291–1797" (in German). Heer, Oliver (2013). "Eingereichte Listen bei den Nationalratswahlen 1971 – 2011, nach Parteien [Submitted lists for the National Council elections 1971 – 2011, after parties]" (Excel). Federal Office of Statistics. http://www.bfs.admin.ch/bfs/portal/de/index/news/01.Document.137072.xls. Retrieved 19 November 2013. Heimer, Željko (2000). "Aargau canton (Switzerland)". http://www.crwflags.com/fotw/flags/ch-ag.html. Retrieved 19 November 2013. Hoiberg, Dale H., ed (2010). "Aargau". Encyclopædia Britannica. I: A-ak Bayes (15th ed.). Chicago, IL: Encyclopædia Britannica Inc.. ISBN 978-1-59339-837-8. Kayserling, Moritz (1906). "Aargau". In Singer, Isidore. The Jewish Encyclopedia. New York, NY: KTAV Publishing House Inc.. http://jewishencyclopedia.com/view.jsp?artid=3&letter=A. Luck, James Murray (1985). A History of Switzerland: The First 100,000 years: Before the Beginnings to the days of the Present. Palo Alto, CA: Sposs Inc.. ISBN 0-930664-06-X. Ogrizek, Doré; Rufenacht, J. G., eds (1949). Switzerland. World in Color Series. New York, NY: Whittlesey House. Sauerlände, Dominik (2002): Berner Aargau in German, French and Italian in the online Historical Dictionary of Switzerland. Steigmeier, Andreas (2010): Aargau in German, French and Italian in the online Historical Dictionary of Switzerland. Steigmeier, Andreas (2002): Baden (AG), County in German, French and Italian in the online Historical Dictionary of Switzerland. Van Valkenburg, Samuel (1997). "Aargau". In Johnston, Bernard. Collier's Encyclopedia. I: A to Ameland (1st ed.). New York, NY: P.F. Collier. Wohle, Anton (2006): Freie Ämter in German, French and Italian in the online Historical Dictionary of Switzerland. Aargau in German, French and Italian in the online Historical Dictionary of Switzerland. "Aargau". Encyclopædia Britannica (11th ed.). 1911. "Aargau". The Nuttall Encyclopædia. 1907. "Aargau". Collier's New Encyclopedia. 1921. This page uses content from the English language Wikipedia. The original content was at Aargau. The list of authors can be seen in the page history. As with this Familypedia wiki, the content of Wikipedia is available under the Creative Commons License.